We've had a really fantastic year at Halfway Home Media thus far, and I have personally been fortunate to have the opportunity to work with some phenomenal people on some really creatively rewarding projects. I've listed a few of the more notable episodes from some of those podcasts below. Please note that this is all subjective. By no means am I saying that these podcasts are the "best" that we have produced. These are simply some of the stories that I keep thinking about as I look back on our work over the last several months. When host Clay Collins originally approached me about collaborating together on his new podcast, Flippening, it felt like a match made in heaven. Clay is the founder of Leadpages and his new project Nomics aims to provide the best Cryptocurrency and Bitcoin Market Data available in the world today. Clay's passion for the newly emerging cryptocurrency markets and his desire to talk about topics that were disrupting the traditional world of finance really attracted me to this podcast, and I'm incredibly proud of what we have been able to accomplish in such a short period of time. Tokenize the World is a three-part documentary, which aims to be the single most comprehensive look at security tokens available today. It's an ambitious project, but Clay is an ambitious human being, and his insight and curiosity shine through in this series. I have been involved in the audio production of The Tropical MBA Podcast for nearly five years. In that time, I have heard stories from entrepreneurs around the world. Many of those stories have similar themes, but I will never cease to be amazed by the ingenuity and gumption that many of the entrepreneurs on this show have shown over the years. We've had a lot of memorable episodes in 2018, but by far one of my favorites is this conversation with Corey Reuth. Corey is the deal-making mentor of Tropical MBA host Ian Schoen. Corey flips vehicles to make money, and in this episode, he and Ian share strategies about how to make money by buying and selling. This might seem like basic information to some, but Corey's insight is incredibly valuable, and the techniques that he and Ian share are so universal. The thesis of this episode is that anyone can make money by buying and selling things. As a "deal dog" myself, I love this philosophy. One of the reasons I've shared this episode with so many people this year is because I believe there is at least one piece of information that nearly anyone can learn from listening to it that will help them make money. Side Note: Do yourself a favor and check out Before the Exit: Thought Experiments for Entrepreneurs. This is the first foray into the literary world by Tropical MBA host Dan Andrews, and it is also my first experience as an audio engineer in producing an audio book. This book has completely changed the way that I think about business in general, and how to prepare for my own inevitable "exit". It's worth every penny of the money that it costs and every minute of the time that it takes to read or listen to it. I'm not just saying that because I know the author, though I figure if I plug Dan's book enough, he might feel the pressure to write another one. Let me preface this by saying that this episode of Good to Be Home is far and away one of the most emotionally charged episodes of a podcast that I've ever been involved with producing. Entrepreneurs Russ & Mika Perry reached out to me earlier this year about producing a weekly podcast where they spoke about business, marriage, parenting, and sobriety. In essence, they are seeking balance in life, and this podcast serves as an audio documentation of their quest for that balance. Russ is the author of The Sober Entrepreneur, which details his transition from an alcoholic to the head of a seven-figure design agency. As a former addict turned entrepreneur myself, I found a lot of common ground in Russ' story. In our initial conversations about what kind of topics we wanted to talk about on this show, Russ shared a blog post with me that Mika had penned called We Saved Our Marriage. In it, Mika opened up about how an affair in 2012 nearly destroyed their relationship. I was so moved by Mika's writing and her courage in opening up about this topic, that I knew it had to be one of the first things we talked about on this show. Earlier this year, we produced an episode about the affair, the aftermath, the blog post, and the reception that Mika received in writing about their marital woes. I've always believed that the most difficult things to talk about are often the things that we should be talking about the most. In a world where so many people work tirelessly to make their digital lives appear perfect, to open up about marital problems and addiction can feel downright taboo. I am so proud of the two of them for the way that they addressed such a tumultuous period in their lives, and for their willingness to pull down the veil and allow themselves to appear vulnerable. We really have been blessed to be a part of such memorable and thought-provoking content thus far in 2018. Truthfully, this is such a small sample size. 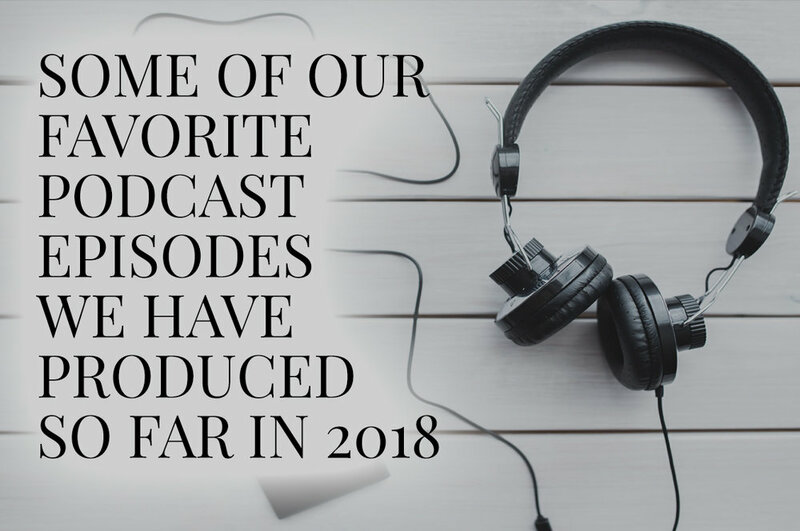 I could go on and on about the episodes that we've produced this year that didn't make this list (and I'm sure that I will in the future). From those of us here at Halfway Home Media, thanks for making 2018 such a terrific year for us so far. We can't wait to see where the rest of the year takes us.